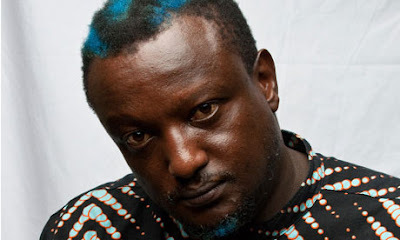 Kenya's author Binyavanga Wainaina was viciously assaulted by a racist taxi driver in Berlin, Germany, as a crowd watched in glee..
Mr Wainaina, who is recovering from a stroke that had affected his speech, was in Berlin on a Daad Fellowship, one of the most prestigious in the world. The attack came a few moments after a black woman had warned him to not venture outside on a bicycle, and that four Ghanians had been killed the previous Saturday. But the 'careless' Kenyan author ignored him and proceeded to his apartment in Charlottenburg where he called a taxi to come and take him to a clinic. As he sat on the back seat of the car and began looking for the address of the clinic on his phone, the impatient driver became agitated. The driver then suddenly got out of the car and went to Mr Wainaina's side, opened the door and began beating him. My Wainaina's neighbours just watched without coming to his aid. The Kenyan author has since moved to Zurich, Switzerland. Here is the author's description of the event in a post on Facebook on Tuesday. Berlin chronicles. Am in Berlin as one of the writers on a Daad Fellowship.. This is one of the most prestigious fellowships in the world. Berlin is a city of bikes. I live in Charlottenburg. You don't see black people in Charlottenburg. Today I was out shopping on my bike. I came out of Peek and Somethingburg all excited because I am off to dar es salaam tonight to see my in -love. Anyway am busy rushing about. My gorgeous apartment is a mess. Anyway, I am walking as carelessly as usual heading to unlock my bike when i see her – a black woman looking at me. She says, " I saw you the other day, cycing carelessly, on Saturday we buried 4 Ghanians. They kill you just like that you are nothing to them. Me-you cant see me on bicycle – they are supposed to remain 4 metres from you, but they don't. They kill you. I don't need a degree to say she meant Germans. But I am careless,and Berlin is a city designed for careless people. Except her – and I suspect they are many others like her. Anyway, I left her carelessly and rushed home, put my new clothes on top of my suitcase – and called a cab. I had finished my prescription medication the day before so I had called the cab company I like because they dont mind that i dont speak German and – since my stroke I have a few speech defects – I mangle 22..stuttgarter platz ..and they don't mind. The cab was waiting. I got in, sat down carelessly and started to look for the address for where was going on my phone. And the website of the clinic i was going to was one of those that maybe dont fit a phone so well. Any way it took a long to me to get the address. Clearly the taxi driver was not a patient guy. He asked me several times to hurry it, but si the meter is running, and i am paying him? So he gets out of the car and comes across to my side, and opens the door. I am clueless what is going on because he is beating me, my bag is on the ground , we scuffle but he is stronger, I am crying now. Loud. In front of my neighbors , it is fiveissh the lady at the shop who makes it a point never to say hello to me is relishing everything, nobody comes to my aid. I feel black, dirty. I feel as if this kind of thing is supposed to happen to somebody like me. Am in Zurich writing this, on my way to see my inlove.